The Si500 Video Speaker Microphone (VSM) dramatically increases situational awareness, information gathering, and evidence collection in the field. Part of the revolutionary Si Series of body cameras, it delivers all the mission-critical capabilities first responders, police officers, commanders and investigators want in one exceptionally smart collaborative device. 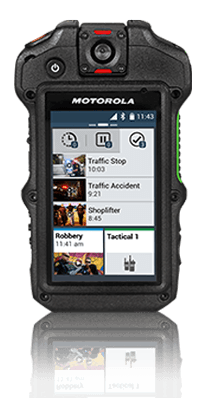 Unlike typical body-worn cameras, the Si500 combines voice communications, real-time video, still images, voice recording, and emergency alerting into one device. The Si500 is paving the way for convergence by reducing the number of the devices first responders wear in the field. Capture and record events the moment they happen, then have the real facts and footage to review, whenever you need them.